KHADIJAH IBRAHIIM’S house smells like sage. It has a calming effect – as does the way she carefully teaches her aunt how to tie a head wrap using different materials she bought on her travels to Africa. 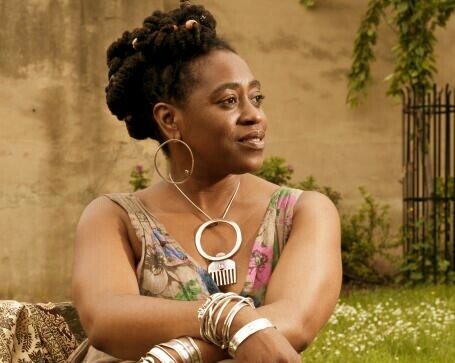 Over a cup of lemon and ginger tea, the poet unravels her past and reveals how it has made her the woman she is today as well as inspiring Another Crossing, her critically acclaimed book of poems, which was published last year. Ibrahiim, a mother-of-three, first fell in love with poetry as a youth growing up in Harehills, one of the most multicultural communities in Leeds. “I loved where I grew up,” Ibrahiim told The Voice. “It was this whole community of caring and sharing. It was very rich in terms of my cultural experiences. Our house had a lot of visitors. My Mother’s Dutch Pot of Stories reflects on how my mother would tell tales while she was cooking. She would cook for christenings, parties, or blues [shubeens] that we sometimes held in our basement. But while her family home was a place of security, at Intake High, a performing arts school, she faced a hostile environment. As one of the few black pupils, Ibrahiim, heralded as one of Yorkshire’s most prolific poets, faced blatant racism and was called names like ‘jungle bunny’ by her peers. Understandably, she struggled to fit in. Her mother decided to remove her and sent her instead to a nearby school in the Harehills/Chapeltown area of Leeds, which was more multicultural. But what Ibrahiim saw there was sometimes as uncomfortable. Pupils from Jamaican backgrounds would clash with those from St Kitts and Ibrahiim was left unhappy by the cultural divisions. In fact, she described secondary school as some of the unhappiest years of her life. But after having her first child and then returning to school for sixth form, things started coming together. In 2001, the self-dubbed Travelling Poet visited Jamaica. In her poems, she speaks lovingly about the island’s rural areas and the peace that she found reconnecting with nature. Upon her return to the UK, the proud young mum went on to study a degree in Arabic and Middle Eastern studies at the University of Leeds, supporting herself with a part-time job. And, as part of her course, she visited Yemen – one of many sojourns that have inspired her and informed her work. But there is something else that has inspired her: her grandson. Working with other lauded UK poets from Benjamin Zephaniah to Linton Kwesi Johnson, Ibrahiim sees her community work as a means of giving back to the city she loves. “I didn’t wake up one day and say ‘I’m giving back to the community’. I mean, giving back is also a personal thing that you do and I’ve always worked in the community. It’s about what you give of yourself and your time, whether that’s charity work or community-based work. Set up in 2003 by Ibrahiim who serves as artistic director, Leeds Young Authors, is a place where youths can tackle their emotions and life challenges through writing. “Even though we are in that workshop, we have to open them up and expose them to an audience with performance. I believe it’s a successful project, not measured on finances but on commitment and stability. Members come because they feel it’s a safe place, a writing community,” she explained. Beyond her life as a poet, Ibrahiim works for the Black Health Initiative as coordinator of the teenage health and wellbeing section. The organisation works to establish equality in Leeds and surrounding areas in terms of health and social care. Her role entails encouraging teenagers to look after their health and wellbeing, coordinating events and engaging them in the youth ambassador programme so that they can promote wellbeing amongst their peers. Currently, the poet is working on a national tour promoting Another Crossing. It will be a rare opportunity for people to listen to the poetry recited in Ibrahiim’s voice as well as discuss the issues raised.